These are the only writings of KING OG the Rephaim. The Rephaim being a Biblical race of Giants that Moses eventually had to eradicate in Numbers 21 of the Bible. 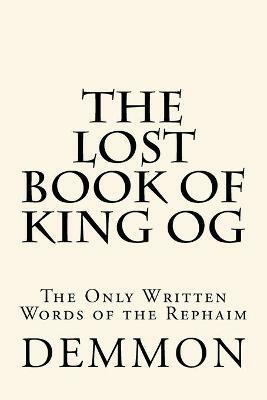 Originally transcribed during a several hundred year swath in and around 1400 BCE, THE LOST BOOK OF KING OG is a controversial, heretical tome that reads like the Bible. In fact, it has been heavily speculated that the original architects of the Bible were on intimate terms with THE LOST BOOK OF KING OG, which explains instances of similarity in metaphor and verbiage. Previously, the only way to look into this particular pre-Biblical flood, Rephaim/Nephilim world of Giants was through THE BOOK OF ENOCH and other DEAD SEA SCROLLS. Author DEMMON has brought forward a previously lost, heretical book that features the only Aramaic to English translation of the remaining mostly-complete copy of THE BOOK OF KING OG the Rephaim. While not entirely complete, THE LOST BOOK OF KING OG offers the greatest comprehension yet of the antediluvian (PRE-FLOOD) and postdiluvian world, from the eyes and ears of the Rephaim. The Catholic suppression of this text has always been due to the fact that THE BOOK OF KING OG is a pagan book. The pagan/blasphemous aspects of the tome (a championing of the uncircumcised for example) make its "burial" by the Catholic Church completely logical. Soaked in Baal worship and child-sacrifice, it is no wonder that the book had been silenced. The Catholic argument that the decision to rid the earth of the text was "God-inspired," is in fact, spiritually sound. With Constantine's systematic destruction of non-Christian texts in and around 326 CE, and the following Gelasian Decree of the 5th century CE, knowledge and/or reproduction of Og's verses was rendered impossible. ..". and whatever disciples of heresy and of the heretics or schismatics, whose names we have scarcely preserved, have taught or compiled, we declare to be not merely rejected but excluded from the whole Roman catholic and apostolic church, and its authors and their adherents to be damned in the inextricable shackles of anathema for ever [sic]." THE BOOK OF KING OG is referenced by association throughout (relatively) recent history, perhaps most notably in the NEW HISTORY OF ECCLESIASTICAL WRITERS published in 1693. In this reference book, the BOOK OF KING OG is described as, "Forged by Jews and Hereticks both Fabulous and Erroneous." Written closely with Vatican translator FATHER MARTIN, THE LOST BOOK OF KING OG serves as a warning, a prophecy and an explanation as to why the Rephaim and Nephilim Giants no longer walk the face of the earth. The recent uncovering of the CASSIODORUS DONATION of 550 CE to the Catholic Church has revealed the most intact, albeit horribly preserved, copy of The BOOK OF KING OG yet. The CASSIODORUS text was used as the primary source material FATHER MARTIN used for his translation THE LOST BOOK OF KING OG. Providing information on a modern, unspeakable evil, THE LOST BOOK OF KING OG will make all who read it consider their religious beliefs and their conclusions about the giants of antiquity.